JULES MASSENET AUTOGRAPH MUSICAL QUOTATION Signed. French composer, best known for his operas. An attractive quotation of 8 bars on three staves from his opera 'Griselda' (Griselidis). 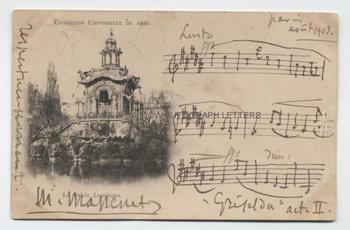 Signed by Massenet, who has also added the title, the place and date (Paris, August 1903) and the word "respectueument". 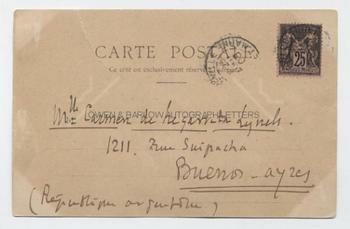 Written on a post-card for the Paris Exposition Universelle 1900 and addressed by Massenet on verso to Mme Carmen de Negarrita Lynels [?] 1211 rue Suipacha, Buenos Ayres, Republique Argentine. Some marking and creasing but generally VG. Massenet's 3 act opera, Griselidis, had first been performed in Paris in November 1901 and it remained in the repertory of the Opera-Comique until 1906. In 1903 it was also performed in Marseille and it is interesting to note that the post-card bears a Marseille post-mark, dated 25th August 1903. It appears, therefore, that Massenet wrote the post-card in Paris but posted it in Marseille, presumably when the production transferred from Paris to Marseille in August.